It’s very important to avoid being emotionally affected by the stock market tape. If you are moved by it, don’t trade based on those emotions. Stocks swing wildly while the economy shifts slowly. There are only extreme, quick moves in the economy in times of panic during terrible recessions like in the 2nd half of 2008. Currently, the economy is nowhere close to a 2008-like event as of December 2018. So investors can safely take a step back and review the economy objectively. Cyber Monday sales were up from $6.6 billion to $7.9 billion which is an increase of 19.3%. The holiday shopping season is also getting a boost. There’s an extra week between Thanksgiving and Christmas. 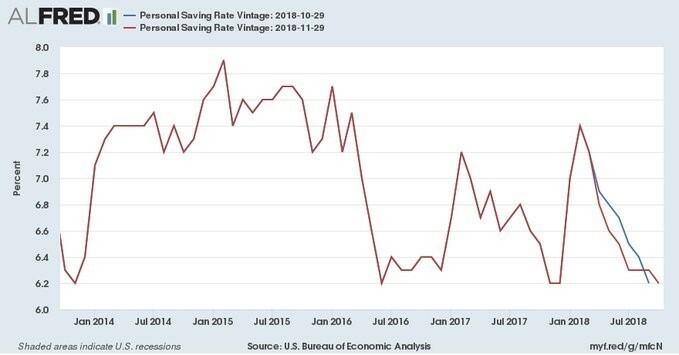 As you can see from the chart below, the savings rate in October decreased to 6.2% which is the lowest rate since December 2017. Consumer is lowering its saving rate because it is optimistic as the labor market is very strong. The savings rate bottomed at 2.2% in July 2005 which signals there’s more room for this rate to decline before it becomes worrisome. My main point here is before fearing a recession in early 2019 because stocks are falling, recognize that the consumer is still strong. Also, the CNBC rapid update shows the median of 10 estimates expects 2.8% GDP growth in Q4. Economic growth is slowing, but not falling off a cliff. The Chicago Fed business barometer index for November was 66.4 which beat estimates for 58 and the October reading of 58.4. It was far beyond the high end of the estimate range which was 59.2. However, it was a few points away from the cycle peak. New orders had their strongest reading in 4.5 years and delivery times were the longest in 14.5 years as demand exceeded supply. There was solid growth in production and backlogs. Hiring increased which is better than some of the other regional indicators. 1/3rd of the respondents stated there were labor issues. There isn’t quality labor because the manufacturing labor market is very tight. Input costs eased. As you can see from the chart below, the regional PMI readings have seen their prices paid trackers fall on average. They remain tightly correlated with energy inflation. 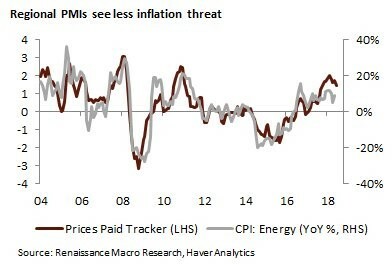 The overall inflation readings are also correlated with energy prices. To be clear, I’m not going out of my way to only show positive economic reports to support the thesis that the economy isn’t falling off a cliff. That’s simply reality as growth is slowing, but there’s very little risk of a recession in the first half of 2019. The November Markit PMI was solid as it came in at 55.3 which met estimates and was down from 55.7 in October. New orders growth accelerated to a 6 month high and the employment reading was the 2nd highest of the year. Just like the Chicago Fed report showed, there were capacity issues as backlogs rose and vendor performance slowed. On the negative side, production growth slowed and business confidence was the weakest since September 2017. Even though the PMI hit a 3 month low, factory output is growing at about a 1.5% annualized rate and GDP growth will likely be 2.5%. Bears who are suggesting a recession has already started because the yield curve is flattening are very wrong. GDP growth will have a two handle, which is slower than Q3’s growth, but not a recession. Even though business optimism was relatively weak, 36% expect output to be higher in one year and 3% expect it to be lower. The main takeaway is slowing growth doesn’t equal a recession. The November ISM PMI was much better than I expected as it was 59.3. That beat estimates for 57.2 and October’s PMI of 57.7. I agreed with the consensus as I thought it would decline from October. The chart below shows the regional manufacturing index in relation to the ISM PMI. Regional index fell while ISM index increased. That divergence probably won’t continue. Meaning, if the regional Fed reports show more weakness, I expect the ISM PMI to fall in December. 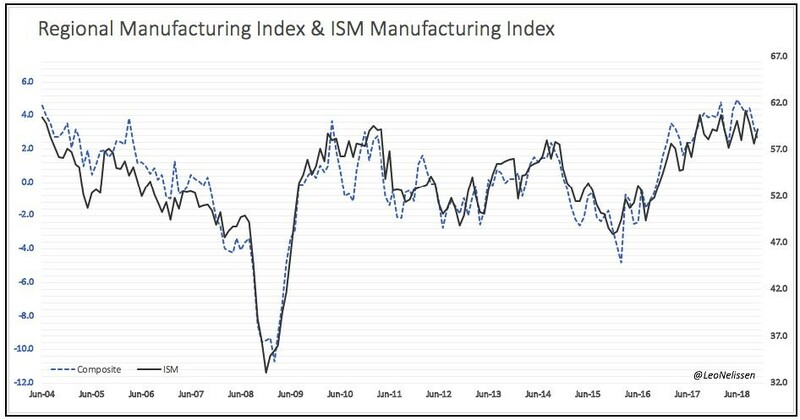 This ISM manufacturing report was way better than what the hard data has shown. It implies GDP growth of 4.9% in Q4. There’s no way that is happening. But it’s not impossible for manufacturing to outperform the service sector. We still only have the hard data from the first month of the quarter. This PMI was the highest reading since September 2018 and was slightly higher than the 12 month average which is 59.2. The new orders index was up 4.7 points to 62.1. That’s the best reading since August. Production index was up 0.7 to 60.6. Prices index cratered 10.9 points to 60.7 because oil fell 22% in November which was the worst monthly decline in 10 years. Let’s now review the quotes to get the qualitative details of this report. It will be unfortunate if many firms make plans to move out of China and then a deal is done. The business plans catalyzed by the trade war with China will have been completely unnecessary if a deal is worked out. To be clear, I’d rather see some unnecessary plans scrapped than an all-out trade war. A trade war will hurt the economy in 2019. It is already vulnerable as global trade growth is expected to be below trend in Q4. The Markit PMI, ISM PMI, Chicago PMI, and Cyber Monday sales all suggest the economy isn’t falling off a cliff. Growth is slowing, but that doesn’t indicate a recession is coming in the first half of 2019.